General: Eurasian is a modern designer crossbreed. The breed was created by using European Shorthairs and Oriental breeds, and its unique combination of traits from these breeds was achieved by selective and purposeful breeding. Mysteriously, the breed is known for occasional bobtails, and it's unclear from where breed originally got them. 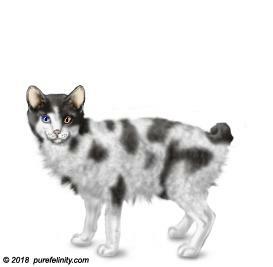 Some say bobtail was a random mutation in the breed, while others have theorized that Japanese Bobtails were involved in the early days of the breed creation - but there are few stubborn old time breeders who insist to this day that original Eurasian never was a crossbreed, but a descendant of white and bobtailed rare hunting cats from the Northern Eurasia. These old timers claimed that the only true Eurasian is a bobtailed one while the opposing Eurasian breeders fought hard to exclude bobtails from the standard, claiming that short tails did not fit the idea of the European-Oriental crossbreed. In the end, both tails were accepted in the official standard, and the heated debate over the breed's origins continues.